I recently received a letter—yes, an actual letter—handwritten to me by a high school classmate. She had heard of my husband’s medical concerns and wrote to express support and offer prayers for us. She began by saying she knew letter-writing was not common anymore; people phoned, e-mailed, or posted on social media. Taking time to write, she sacrificed her convenience for a more personal encounter. Coming to visit was out of the question, as she lives in San Diego, but I think she would have done that had she lived any closer. 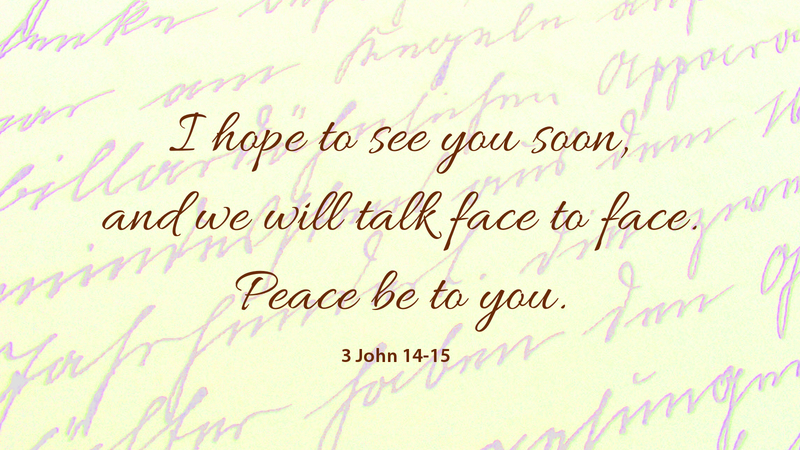 In this letter from John to his brother in Christ, Gaius, he expresses the sentiment that he would rather not write with pen and ink, but would prefer to talk face to face. In a world in which we touch each other electronically or as disembodied voices on the phone, what do we sacrifice by missing that personal encounter? When Jesus called his disciples, he did so face to face. He had face to face encounters with the woman at the well, the lepers, and many others. When God came to save us, he did so face to face, the personal, embodied encounter with the God who came as one of us, to bring us life. Prayer: Dear Lord, help us see you face to face in our encounters with others, that we may experience the love you have for us, embodied as you intended. Amen. Today’s devotion was written by Marty Ramey, Interim Pastor in the Carolinas Mission District.